RBT. MORRIS TOBACCO CO / SAL FREIGHT DEP. The Corcoran deck is near the end of a ~$3M revitalization project. Had no idea this was the first parking deck in Durham. If you look closely at the 2007 vs 2010 photos, you can see the new white LED lights now installed in the deck that replaced the orange lights in there before. I understand the project also included a fair amount of painting and signage upgrades. This is a fabulous piece of historical detective work and reporting. Please keep up the good work! This is indeed first rate. If you're wondering what all those Prize House entries on the Sanborn maps are, see the August 26 2008 posting for the Venable tobacco company. I was born in Hillsborough, and still reside here. Always interested in the history of Orange Co., and proud of it. In all these years I never heard of R.F. Morris and his company. I never thought about digging deep into how the tobacco industry got started, and developed this area, because I've always been told the Dukes did it all. To find out now that they were really late comers actually, although they certainly took it to a level no one could have imagined. And enriched so many people's lives thru a now vilified product. I never knew any of this until I started reading this blog. I know many of these places before the destruction began. My heartfelt thanks for doing such a wonderful job of shining some light on the befores and afters that have slipped up on many of us. We've been slowly boiled without realizing it, like the fabled frog. Please keep up the great work. All I can do is thank you. Since we're apparently stuck with this parking deck for some time, at least the revitalization project has done an excellent job in making this parking structure look almost brand new again. Of course, this renovation, like the new parking garage for the courthouse, missed a good opportunity correct urban design problems while also correcting the cosmetic/structural issues. The design of this structure, with the spiral ramp in back, and one way in entrance from Corcoran St., could have allowed something to built out (retail/office) in the Corcoran/Ramseur corner at ground level to anchor the intersection down to American Tobacco and to the DPAC and the DBAP. A communist russia-themed bar, perhaps, to compete with the cuban revolution? Of course, integrating street life would have been even easier in the clean sheet design for the courthouse parking garage, which I will continue to lament until the end of time. "Sometime between 1903 and 1906, the factory was torn down, and the Seaboard Airline RR built a freight depot in its place." Anybody have any good guesses why it was called an "Airline" railroad? Since the Wright Brothers didn't get it all figured out until 1903, I'm reasonably sure that "airline" did not mean back then what it means now. KWIX asked: Anybody have any good guesses why it was called an "Airline" railroad? Wikipedia says, quote: "Air line", in the days before air travel became a reality, was a common metaphor for the shortest distance between two points: a straight line drawn through the air (or on a map), ignoring natural obstacles. Hence, a number of 19th century railroads used "air line" in their titles to suggest that their routes were shorter than those of competing roads. Thanks, Anon! That's very interesting -- really gives you a window into how people were thinking a century ago. "Morris first appeared on Orange County scene .... in Hillsborough, where he owned a variety store in 1847. The same year, he was granted a license to retail liquor at the Hillsborough House, the old Faddis' Tavern of the 18th century. In 1848 he was licensed to 'hawk and peddle' goods in Orange County. In 1850, then 36 years old, he was the hotel keeper of the Hillsborough House. He bought his first property for 10 dollars at a sheriff sale in 1851: 200 acres of William Copley's land near the Pin Hook area. Sometime in the early 1850s, recognizing the opportunity for his services in Durham, he moved to the tract of land that Andrew Turner had owned and took his chances running a hotel there." Boyd reports that in 1858, Morris moved to Durham and open the town's first hotel. "In 1858, Robert F. Morris moved 'to the hamlet and with his sons opened a factory in a small house that stood somewhere on the land now occupied by the Bull Factory. These were the pioneer tobacconists of Durham. Soon they took a partner, [Wesley] A. Wright of Virginia, and the firm name of Morris and Wright appeared. Mr. Wright invented a name for the product - 'Best Flavored Spanish Smoking Tobacco' .... In 1861, [Wright] withdrew from the enterprise, manufactured tobacco independently for a time on the farm of John Barbee, just east of Durham and in 1861 joined the Confederate Army. Dr. Richard Blacknall then became Morris' partner. About 1862 Morris and Blacknall sold out to John Ruffin Green, who had recently moved to Durham from Person County." It appears that it is more likely that RF Morris' son, Thomas B. Morris, was the active partner with Wesley Wright - at least per later litigation over the use of the "Genuine Durham" trademark. Green, of course, would go on to partner with WT Blackwell, and that company would become Blackwell's Bull Durham. Morris grew at least a portion of the tobacco himself; in 1860, Morris grew 12,000 lbs. of tobacco. That same year, he donated an acre of land where the (the original) First Baptist Church stood. By the 1860s, it appears that Morris owned land and buildings that had belonged to Bartlett Durham - the fact that he owned a hotel with an annex called "Pandora's Box" on the same site as Durham's home suggests that he may have turned the house into a hotel. "7: One acre tract with log cabin given to George Bradshaw and his wife by RF Morris (Negroes)"
"15: Tobacco factory of RF Morris & Son (frame)"
"17: RF Morris Home and Hotel (frame)"
"18: Double, log kitchen to hotel. (logs)"
"21: Annex to hotel. Known as "Pandora's Box" 4 rooms & attic (Logs)"
"26: Dwelling occupied by JW Cox, owned by RF Morris"
"27: Small frame house used by RF Morris as an office." "37: Frame feed house in RF Morris horse lot"
"38: Barn & stable of RF Morris"
"39: Blacksmith Shop on RF Morris' land"
Upon returning from the Civil War, Morris had established a new tobacco factory, as noted above, on the north side of the railroad tracks - either in 1865 or 1867. The tobacco business and Durham would grow rapidly from that point onward. "In 1865 there was only one factory [in Durham]; in 1869 there were four, and in 1872 there were 12. Of these, the oldest, next to the enterprise established by JR Green, was that of RF Morris and Son, who in 1867 resumed the manufacture of smoking tobacco in a factory on Peabody St. just west of Corcoran. The brand established was called 'Eureka' and it bore the legend 'Best Spanish Flavored.' In a few years the manufacture of snuff was added, and such is the origin of the famous 'Ladies Choice Scotch Snuff. '.....The town of Durham was formally establishing itself, too, and was beginning to respond to the new prosperity that demand for its tobacco was bringing. The town as it was then is very quickly described. The nucleus was still Robert Morris' clutch of frame buildings, hotel, and annex, double log kitchen, blacksmith shop, office, barn stable, and feed house on the tract now bounded by the railroad, Corcoran, Main and Mangum Sts..... Morris' tobacco business (reorganized in 1865) and Green's were providing the vital spark which kindled the recovery to come..."
In 1868, Morris was elected an Orange County Commissioner; in 1869 a Town Commissioner. 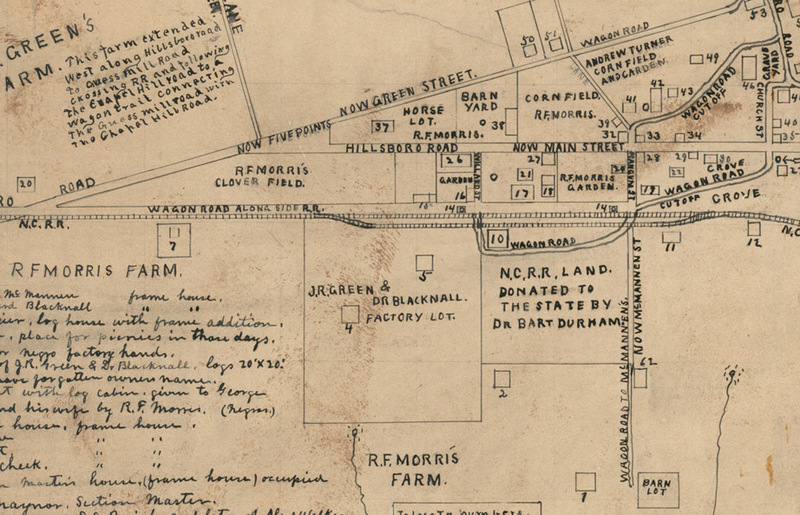 In 1869, Morris paid the largest property tax assessment in Durham, $40.62. It is noted by Anderson that Morris owned significant tracts of Hayti, and sold many of the initial tracts to African-Americans after the Civil War. He is also mentioned as owner of the Maplewood Cemetery tract - his heirs sold it to Dempsey Henderson in 1873. "Mr. Morris entertained the idea that Durham was one day to be a large and flourishing town ; and, incited by this idea, he invested largely in real estate in the future Chicago of the South. In consequence of his real estate investments, he cramped his tobacco business, which was rapidly growing. There was nothing selfish in his nature, but he felt a great pride in seeing Durham grow and prosper. He was generous to all. Mr. Morris did not live long enough to see his pre-conceived ideas of Durham's greatness fulfilled, as it has been within the past seven or eight years that she has made her greatest progress and developed into a young city and a great tobacco mart. 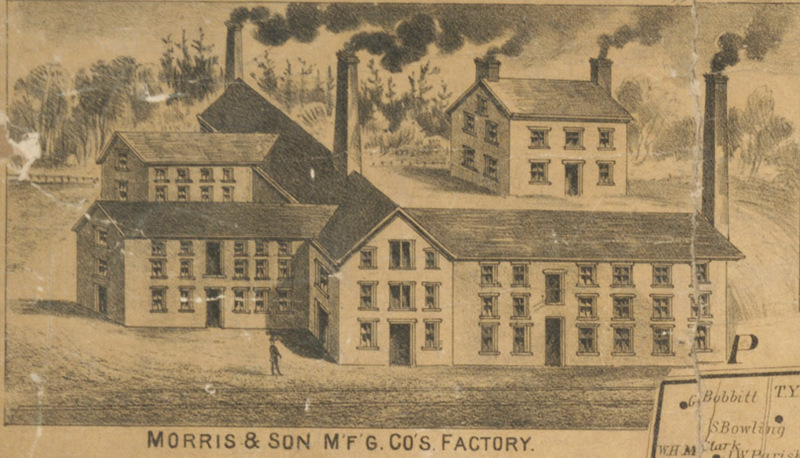 The R. F. Morris & Son Manufacturing Co., of which W. H. Willard is president, and S. F. Tomlinson, Secretary and Treasurer, are the successors of R. F. Morris & Son, and under their supervision the " Eureka Durham " has sustained its high reputation as a smoker, helping to give the smoking tobaccos of Durham a world-wide reputation. Their brands continue to grow in favor and their business is annually on the increase. 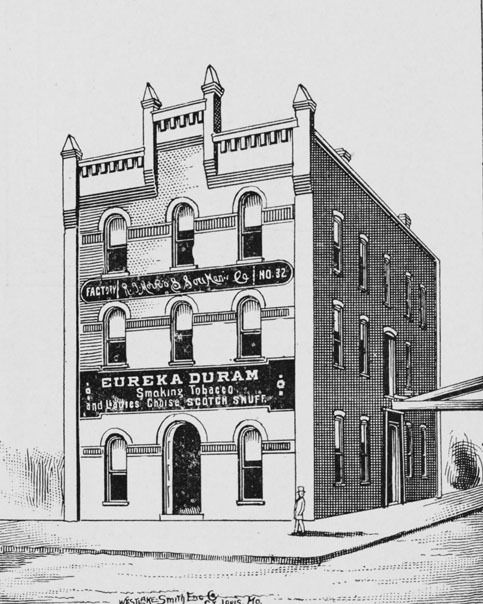 Besides the celebrated 'Eureka Durham' they manufacture the 'Bear' and 'Gold Leaf Durham' the latter being of a beautiful golden color and made from the very finest tobacco grown in North Carolina, and only in a certain locality of the State. This tobacco, like the ' Vuelta Abass,' is of extra fine quality and has a flavor peculiar to itself, which no other tobacco has. This firm manufactures also a superior article of Scotch Snuff, equal to any brand on the market. The name of their brand is '' Ladies' Choice Scotch Snuff.' It is made from the very best North Carolina sun cured tobacco, being entirely free from adulterations and injurious drugs or chemicals. This is a comparatively new enterprise, but a growing one. This firm is one of the leading manufactures of the town." In the early 1890s the company built a distinctive masonry structure facing south towards the railroad tracks. "The factory is a three-story brick, with large two story frame building connected by a passage way from the second story of one to the second story of the other. Both of these structures are situated on Peabody St., immediately in the rear of the 'Southern' passenger depot. This concern manufactures a number of popular brands of smoking tobacco and snuff, among which is the celebrated 'Eureka Durham,' one of the finest brands of granulated tobacco known to the trade. As snuff manufacturers, they have no superior competitors, and find ready sales for all the goods they can put up. The three floors of the brick building are employed as various departments for granulating, packing and stamping, while their frame building is used as departments for snuff grinding and storage of the natural leaf. WH WIllard, the president, is connected with various manufacturing and banking institutions throughout the state, either as an officer or director. Is president of the Morehead Banking Company of this place. Mr. SF Tomlinson, the secretary and treasurer, has the management of these works, and has succeeded in creating a business that is well known to the trade"
Looking northwest from Corcoran St., 1900. The original frame structure is in the right foreground, and the newer masonry structure in the background. The Southern Railway passenger depot is to the left. Looking west-northwest from Corcoran St. at the Southern Passenger Depot, with the RF Morris tobacco company in the background. Tomlinson and Willard continued to business until 1903, when they sold it to the American Tobacco Company. 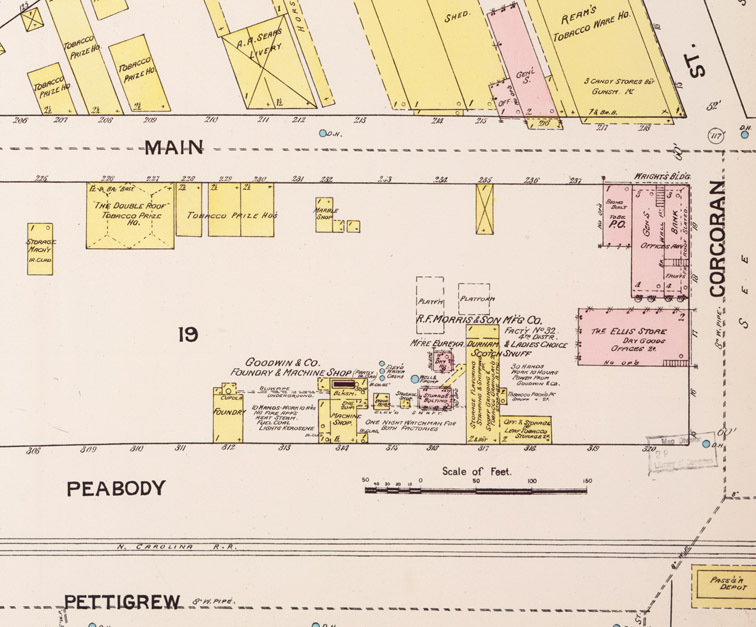 Sometime between 1903 and 1906, the factory was torn down, and the Seaboard Airline RR built a freight depot in its place. 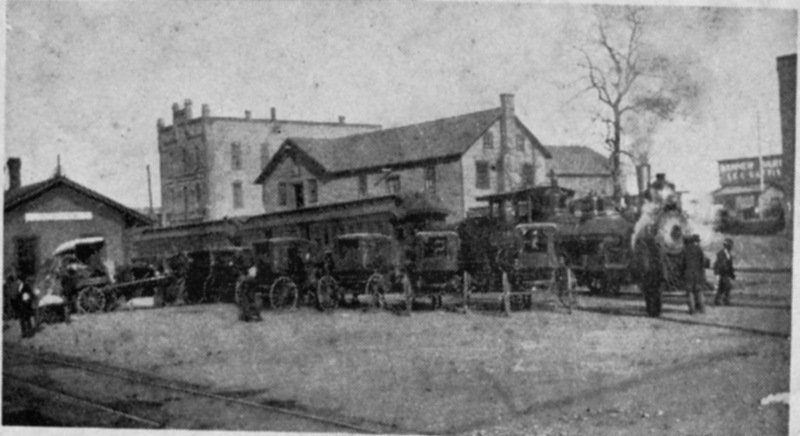 The SAL freight depot was long, low brick structure extending along the northern side of the railroad tracks in the vicinity of the current surface parking lot behind structures in the 200 and 300 blocks of West Main St. This was the site of the city's first major attempt to deal with its parking problem in 1957 - by demolishing the freight depot and converting all of the space between the railroad tracks and the backs of the buildings on West Main St. into surface parking. Partly demolished SAL Freight Depot, looking southwest from around Corcoran. Fully Demolished depot and 100 block of South Corcoran. The lot was soon paved and striped. Businesses on West Main St. began to convert their rear entrances into primary entrances to face the parking lot. Looking west from the Silk Hosiery Mill, 1957. Looking north from Corcoran and the railroad tracks. The completed product, looking northwest from the railroad tracks. In 1969-1970, a roadway was created from the parking lot entry running along the north side of the railroad tracks, south of the parking deck, and connecting east with Roxboro and Ramseur St. - the Loop. As for the parking deck, it hasn't changed much. Looking northwest from Corcoran and Ramseur, 2007. This is indeed first rate.